This weekend was the 45th Annual Dublin Gas Engine Meet in Dublin, NH, on Route 101. Fascinated for decades by the old “hit ‘n miss” engines, you may recall I went last year, and that Alex and I had a fantastic time at a similar show in Orange, Massachusetts in June of 2015. You may enjoy clicking on the links above to see some of what we saw. BLUE BELLE and I tooled off through Keene and down Route 101 in spite of foreboding skies, arriving at 11AM. We had our $5 admission ready while in the queue to enter, but then the lady flagged us instead onto the field. “We want you to exhibit your car, just pull in here instead, and park down on the left – no charge.” And, no argument – I was now parked right on the massive field, and off I went to see the vendor’s exhibits, and the machines on display and operating. One vendor had a model of a machine I would have wanted, and when I went back hours later to make the purchase, it had been sold. I know, “meant to be” but also, “when you see it, get it.” Here is a gallery of some of the different machines I saw this time, and remember you can click on any one to start a show of larger images. And later I saw the same thing on the featured engine, a 1922 Fairbanks Morse. During one shower I moved BLUE BELLE under some trees at the side of the field. The rain was heavier, and people were leaving. I pulled her original top out for the second time ever to keep some water out of the cockpit. Eventually, the skies cleared, and at about 1:15 I decided to just head back home. Back on Route 101, and heading west through Dublin. Up the hill, around the round-about at Yankee Publishing, up the hill, and coming into the curve at Dublin Pond. BUT WAIT !!! How many times have you gone east to west, or west to east across New Hampshire on Route 101? How many times have you looked across Dublin Pond from 101 to Monadnock Mountain? Have you ever wondered what was on the other side of the lake? This time I did – and turned onto East Lake Road. REMEMBER – IF YOU HAVE NOT BEEN ON A ROAD BEFORE — TAKE IT ! Checking my extensive archives this morning, I found a used map of the area to share with you what I did. Lake Road is great, and different mountain views. And, YEAH, eventually became dirt. I was not concerned about getting lost. I knew I was in NH, and my sense of direction keeping me heading west. Eventually I would come to a familiar intersection. The road became Stone Pond, and soon I had a choice – I kept to the right onto Colonial Road assuming it would get me back to Route 101 eventually. GLAD I DID – because at the stop sign at Frost Hill Road, looking to my left was a sign “Historic Cemetery – Historic Site – 1 Mile.” Left turn, and up the hill I roared. 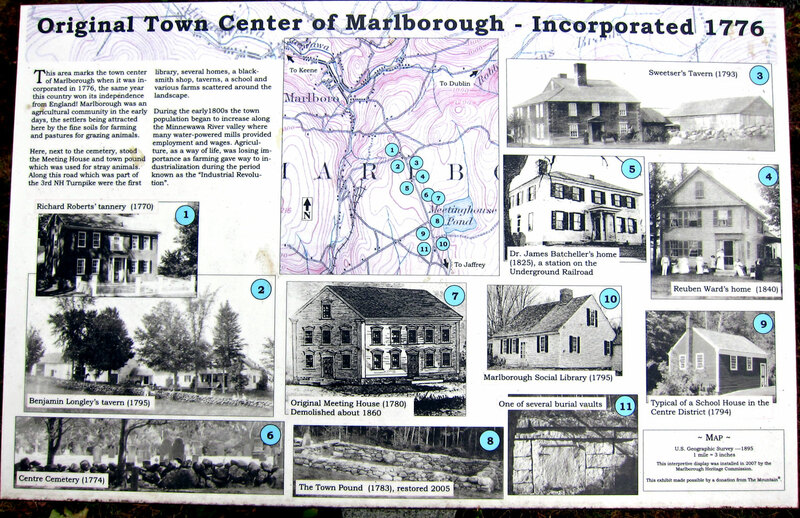 I passed three wonderful period homes, and then arrived at the cemetery, and historic site – the original Marlborough Village – the pink circle above. One of the most beautiful spots I have visited. BB2 parked in front of the cemetery and village site. The above can be “clicked” for a larger readable version. 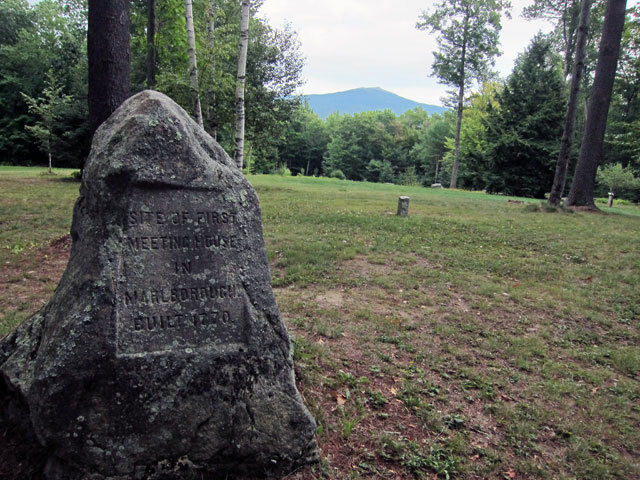 This is the site of the Old Meeting House with Mount Monadnock in the distance. Construction began in 1770 with completion in 1779. It was last used in the 1840s, and in 1865 fell down due to the lack of repairs. At the edge of the village site (walk from spot above towards the mountain) is the Town Pound. Found in most colonial villages, the pound was for impounding stray farm animals. A farmer could reclaim his animal paying a fee to the Pound Keeper for the animal’s care and feeding. I could not resist sharing these granite fence/gate posts. At the fantastic three homes and fields north of the original village there are many more such cut stones in current use. and, most unbelievable, and the first time I had ever seen vaults like these, these family vaults have stone doors which have been sealed. Further south there was another similar number of vaults. Back to my map above. 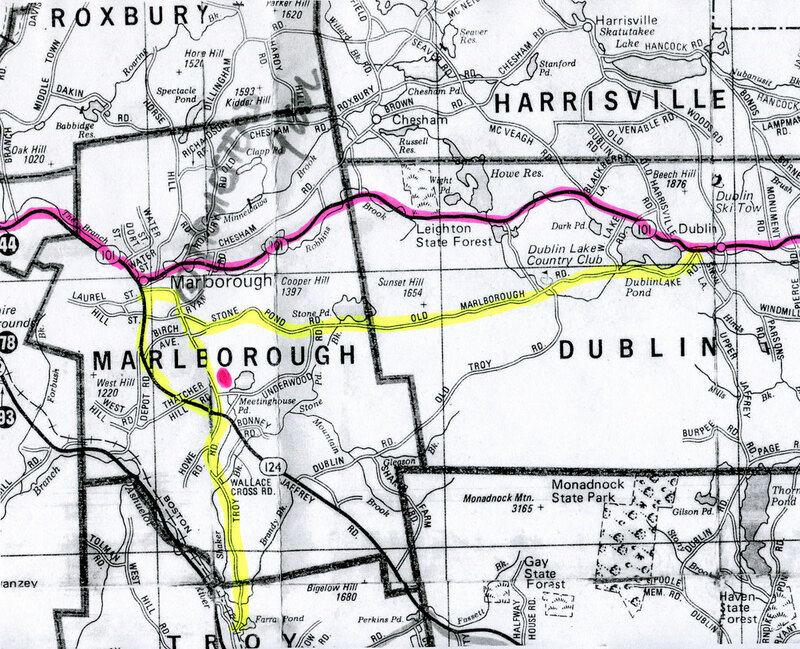 I had to know if and where Frost Hill Road joined with Route 101, so back past the fantastic estates, fields, and views, and yes past the Frost Free Library the road intersects with Route 101 at the eastern edge of the commercial area. My guess is that the Marlborough we know today, is where it is today because of the river and water power usage to run the mills. The population and village just moved down the hill abandoning the original site. But before I went down the hill, I continued south on Frost Hill Road and came to Route 124. Reversing direction, Frost Hill Road ultimately connects with Route 124 at Route 101 (hope this makes sense). So, I headed back out this time on Route 124 toward Jaffrey (filling in the map) until I arrived back at Frost Hill Road where instead of continuing to Jaffrey I turned on Old Troy Road, to head to Troy and Route 12. Arriving on 12, it was time to head home. WHAT A GREAT DISCOVERY. Between Old Marborough Road and Frost Hill Road there are views of Mtn. 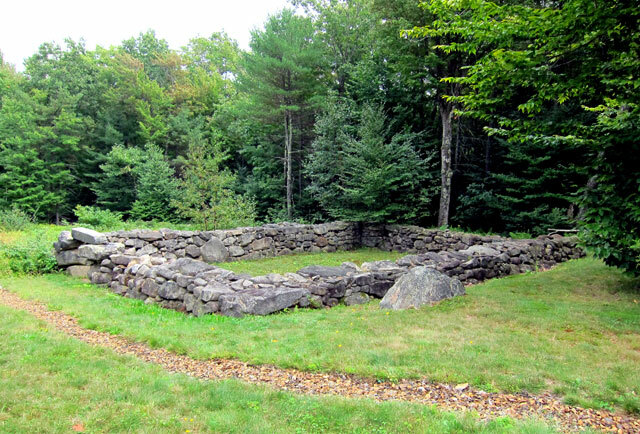 Monadnock that most people do not see. 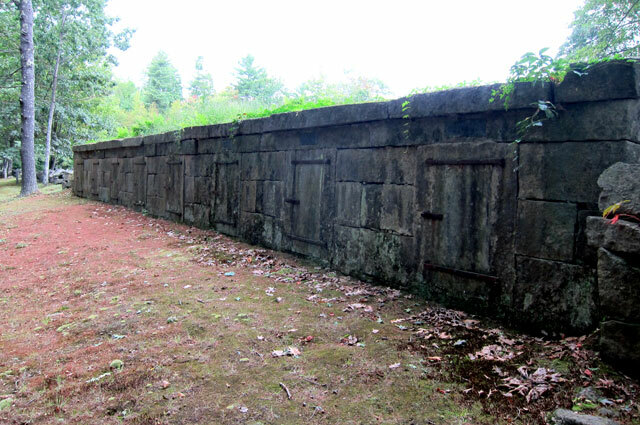 This entry was posted in Day (or maybe two) Trips and tagged Cemetery vaults, Dublin Gas Engine Meet, hit n miss engines, Marlborough, Monadnock Mountain, NH, Old Marlborough Village. Meeting House, Town Pound. Bookmark the permalink. Frost Free Library…….really? You couldn’t make that stuff up. Too funny. Another great adventure, I have been on Frost Hill Road and followed 124 to 12 and home. It is always fun to read about your adventurous travels. Vicarious living can be fun too! I remember seeing a hit-and-miss engine at an Old Home Days, it was running a lathe. Also, I now just realized what a “pound” was. When I was a child, I was told stray dogs were taken to the pound. Well now I realize it is the root word of impound. Love those little word lessons! Hi Ray. 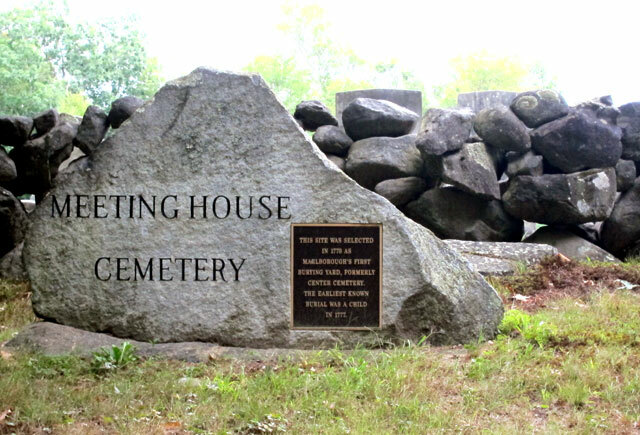 Thanks for telling everyone about my (childhood) stomping ground; Meetinghouse Cemetery was one of my favorite quiet ‘thinking spots’ when I was a kid. 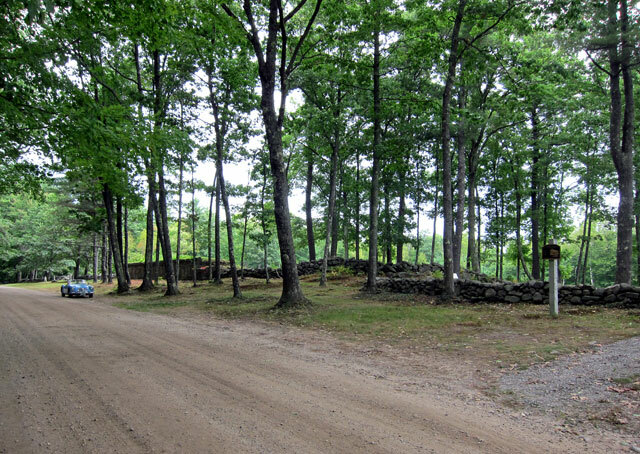 Somewhere around here I have my dad’s maps of Marlborough, which show the location–deep in the woods not far from the cemetery–of an old Shaker village. Not much left now but cellar holes–or at least, that’s what was left back in the ’70s. He also has a few other neat things marked(one of the benefits of having family roots going back a few centuries in one place.) If I find the maps, I’ll update my post.